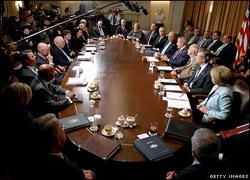 President George W. Bush and his cabinet. On this Presidents’ Day, I find myself reflecting on the leadership of those who have occupied the Oval Office. Often when we think of presidential leaders, we want to believe they are making decisions on their own. If the president happens to be of a similar ideology to our own, we want to praise them for every good thing happening under their watch. If they are not, we want to blame them for every failure. We know though, not all leadership happens at the top. A cadre of people are involved on the decisions of every president. We have been recently reminded of this as President Obama has been appointing and seeking confirmation of several positions in his cabinet for his second term. An important part of good leadership is choosing those who surround the leader, carrying out different aspects of the job, advising on decision-making, and more. Great leaders of countries, companies, and churches are those who surround themselves with the best people. They cannot be experts in every aspect of their job, there are too many details for one person to handle. Good presidents, CEOs, and lead pastors put others in positions of responsibility and give them all the tools they need to succeed. As associates and other church staff members, we are part of the team, part of the lead pastor’s “cabinet.” We are not the ones at the top, setting the direction for the church, getting all the credit or blame. We are instead called to support of the leader, advise the leader where appropriate, and carry out the leader’s vision within our area of responsibility. It is our duty to be the best-of-the-best in our area of expertise within the congregation, to always be growing in our knowledge and ability, and to strive for excellence in all we do. I also want to remind you today, like a cabinet member, you are a leader. You have a team working with you (and if you don’t, get one). As a youth leader or education director, you have a team of teachers and leaders under your direction. As a music director you have choirs, bands, singers, instrumentalists, and others in your care. As an administrator you have teams and committees who are carrying out their work under your leadership. Make sure you are surrounding yourself with the best-of-the-best. If they are not the best-of-the-best right now, develop them into the very best. Give your teams tools to grow into the great leaders they could be. Share relevant books, articles, and blogs with them. Attend leadership seminars with them. Give them space to do their work. Allow them to make decisions with which you might not fully agree. Show them respect in all areas of their work, and give them room to grow. Not all leadership happens at the top of the organization. I would argue it is at least as important, if not more important, to have great leadership ability in the middle of the organization, where we associates serve. Great presidents have great cabinets. Great cabinet members have great teams working with them. Effective pastors have effective staffs and effective staff members have effective teams. Be a great member of your lead pastor’s staff, by developing your leadership from the middle.